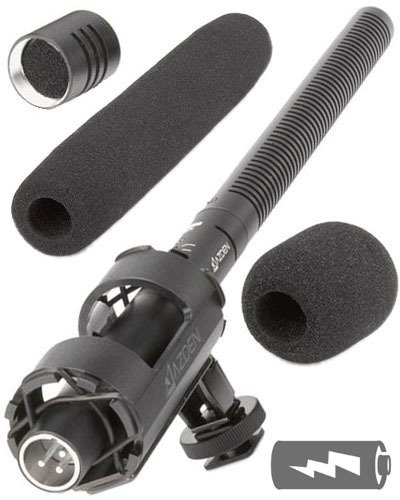 The Azden SGM-2X is a shotgun microphone (XLR) that is supplied with 2 barrels, making it either an omni (8.11" long) or, by adding the extension barrel, a supercardioid (15.75" long). The microphone is be powered with 1x AAA battery. See the matching Rycote Softie windshield for this microphone in its omni directional setup - ideal for handheld work. Either configuration provides a sensitive, low-noise, wide bandwidth signal through its' balanced, low-impedanced XLR output. The mic comes with two foam windscreens, one for each length. The microphone is powered by a single, not included, "AAA" battery (no Phantom Power), which lasts more than 250 hours.